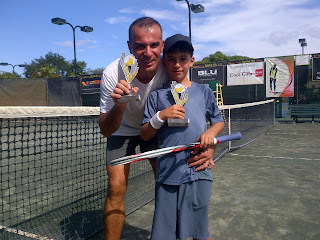 Benoit Benaibbouche, Tennis-Miami's very own French tennis phenom. Despite the French Open having wrapped up this month, Benoit has our full attention as he has been playing down in Miami for several years and has played over 200 matches! And he's loved each and every one of them. I started in late 2010. From a player I met at a tennis club. Twice a week is usually my minimum. I like meeting new players and facing new challenges. The organization as a whole is great, and I like the idea of competing with people who have the same passion about tennis. It was a tournament final back in late 2012. 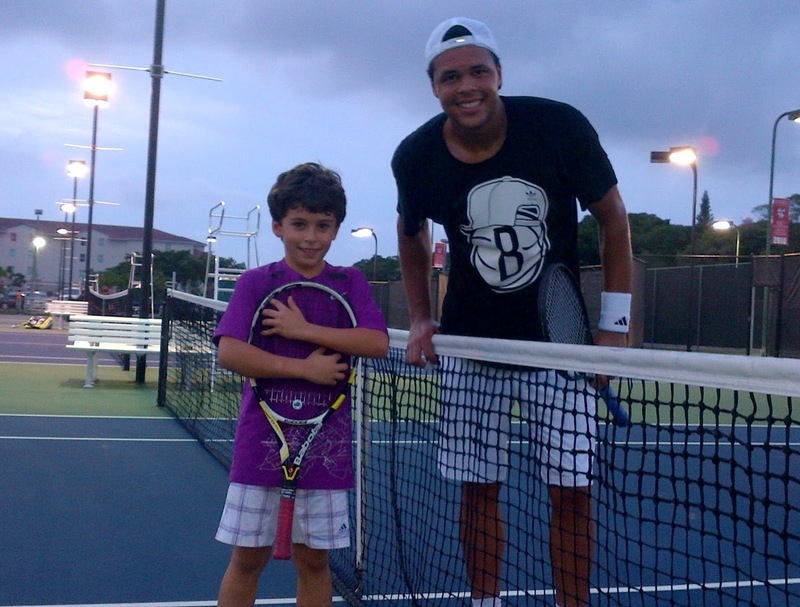 We played in Key Biscayne—great court, great temperature, and a great rival—Nelson Machado. He is a fantastic player and I had never beat him before. 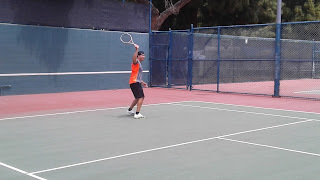 I played my best tennis and won in straight sets. I pushed myself so much as I knew a trophy would be the most exciting award as my son—also a tennis a player—asked me to bring him a trophy… now it’s sitting in his room! Honestly, all the players I meet are fantastic rivals. In general I love to play better players to step my game up. Nothing except the fact that it really is the best. I wish I had more time to promote it more, but overall it’s a well rounded and great league. Against a wall in my hometown Paris, France, in the back of a large parking lot behind the house I grew up in. It sounds like the stories of many big champions, I wish I was one of them! It’s a complete game: Physical, cardio, mental, legs, upper body, and the HEAD! And its never over until it’s over, unlike most other sports where they reach a time limit and the game is over. Federer. He’s a legend: Class, style, fair play, calm, superb tennis… Just a huge fan. I work in a high-end watch group, traveling in the Americas. French born, but I’ve been in the USA for over 17 years. 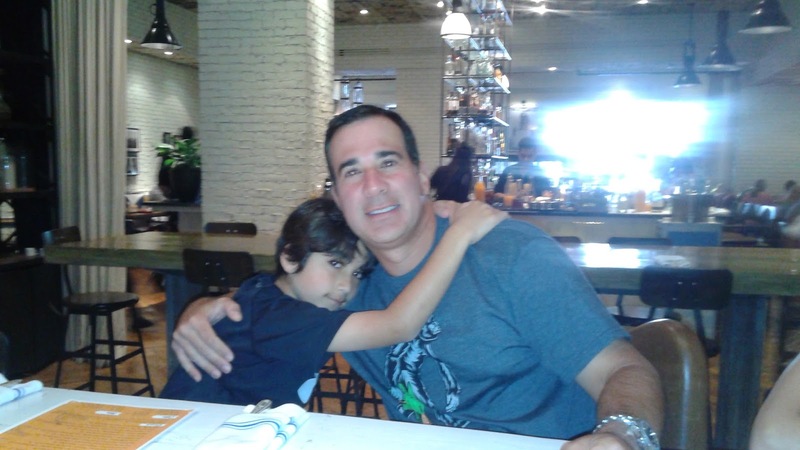 I love traveling to tennis destinations with my wife and son who is a tennis lover too. As you know, tennis can really get your heart pumping and body sweating, but in the Summer it can sometimes be too much because of the heat. Nobody wants to have to sit inside though—they want to play the game they love. Fortunately, there are several things you can do to stay safe when it’s hot out. The biggest risk from playing tennis outside in hot weather is heat exhaustion. This is when the body’s core temperature begins to rise above the normal 98.6 degrees Fahrenheit. It can induce nausea, dizziness, cramps, and even fainting. If left alone, heat exhaustion can turn into a heatstroke. A more serious medical condition that can lead to permanent damage to the body. All in all, an unpleasant experience to be avoided. One of the biggest causes of heat exhaustion is dehydration. To prevent dehydration, you should bring several cold bottles of water and/or sports drinks with you on the court. 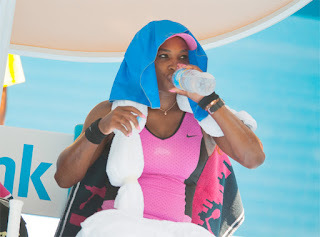 In between every game, or changeover, you should drink enough water to where you’re full. Even if you’re not thirsty, you should drink. It is a good insurance against heat exhaustion. Another leading cause of heat exhaustion is electrolyte loss. When your body sweats, it removes essential nutrients like salt and potassium from the body. This is why products like Gatorade include plenty of electrolytes to help restore that activity during strenuous exercise. It’s also a good idea to consume foods that contain salt and potassium before matches, so that when you sweat it won’t be detrimental. If you haven’t played tennis all summer, and it’s already in the midst of August, you may be in for an unpleasant awakening if you try to match your usual level of play. The body needs to adapt to hot environments, and not over a period of hours, but days. 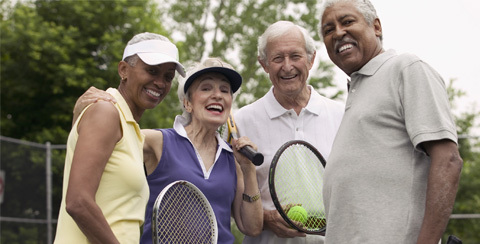 If you plan on playing tennis during the summer, give yourself a few ways to get prepared. This can mean either taking a brisk walk in the afternoon, or just hitting a few rallies with a partner and wrapping things up quickly. After a few days, you can get back to your typical tennis routine. If you’re playing in a tournament or a match through Tennis League or another organization, there are guidelines that must be followed year round. However, if you’re just playing a casual game of tennis you may want to consider reducing the overall amount of time played. For example, instead of playing 3 sets, play 2. Instead of playing for 2 hours, play for 90 minutes. These reductions are your best bet against heat exhaustion. Not only is the heat going to increase your temperature, but playing a tennis match will as well. This is why it is a good idea to take breaks when possible, so that you can reduce your body temperature periodically during the match. Sunscreen won’t prevent dehydration or heat exhaustion, but it’s something that people often forget when spending extended amounts of time out in the sun. If your prone to burning, put plenty on before you head outside. It’s a good idea to use sunscreen designed for sports, as it is less likely to come off from sweat. Playing a doubles match as someone who exclusively plays singles can be a significant change. Despite the rules being the same (with the exception of the doubles line), people often fail to adjust to the dynamic of a doubles match. It’s tempting to turn around at your partner when you’re posted up at the net. However, this is a poor habit. Your eyes needs to be on your opponents. When your partner is hitting the ball, you should watch what your opponents are doing. They may be running up towards the net to hit a volley, or backing up to hit a powerful ground stroke. These split second differences may seem subtle, but in tennis they are very important. You should be talking to your partner on a regular basis throughout the match. This is so that you can let your partner know where you are going, where they should go, what your intentions are etc. If you’re not used to communication on the court, or don’t feel comfortable with it, start small. Perhaps let your partner know where you intend to serve. Communication on the court doesn’t have to be limited to movement or technique—it can just be words of encouragement. It’s also a good idea to avoid too much ‘teaching’ on the court. Technique is best honed during practice sessions, and people may take advice as criticism which will only diminish their play. Going off the last point, because people play doubles with a close friend or significant other, people tend to shy away from giving out commands. It may seem a bit uncomfortable, but giving out directions is crucial when playing doubles—this goes for both partners. If you can’t chase down a ball, let your partner know. If you think they should poach a return, tell them. During a singles match you’re going to be hitting every shot that comes on your side of the net, so if you play singles exclusively you may be tempted to chase down every shot. However, in doubles you have to determine when to take the shot, and when to let your partner get it. This goes back to clear communication and taking charge. If you can get the ball, go for it. If not, tell your partner to chase after it. When you’re not hitting the ball, and your partner is you need to be analyzing the court: Where is the weakness on your side, where are they positioned, where are you positioned relative to the ball etc. 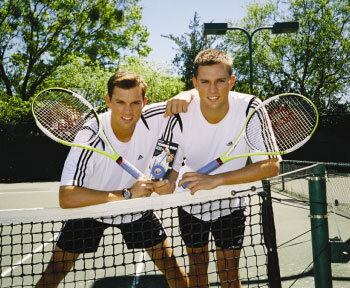 The most dominant doubles teams are the ones that have great chemistry like the Bryan brothers. As siblings, they had many opportunities growing up to play tennis together. Over the years they learned each others’ strengths and weaknesses and have seemingly applied those to their game. To really dominate your matches, you should minimize the number of partners you have. The more you play with a particular person, the better you two will get. Looking to Play Competitive Doubles Matches in Your Area? We have doubles leagues in many of our leagues across the country--from Baltimore, to Denver to San Francisco! Check out the Tennis League website in your city for more details. 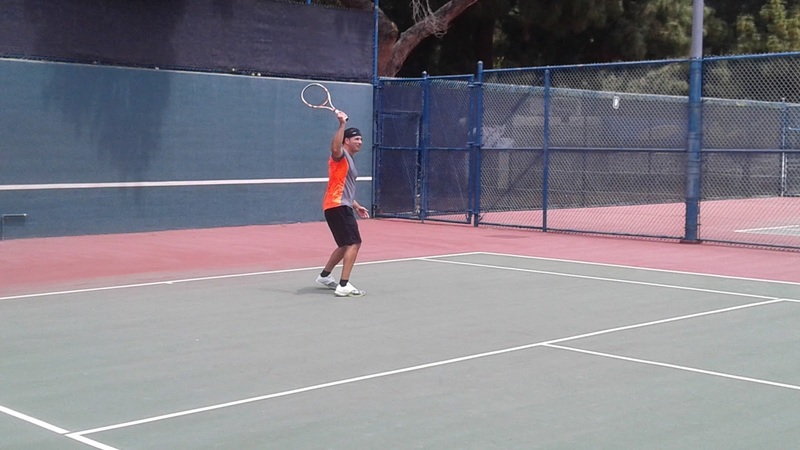 Are you looking for a fun and competitive way to play quality tennis players in your area? Then you have to sign up for our Tennis League Tournaments! Our tournaments are a fantastic way to play tennis in a competitive setting in your city. All matches are designed for your utmost convenience and enjoyment. We kick off a tourney with at least 6 players. If we can NOT reach this criteria then we will refund your entry fee and give you the next tournament for NO COST. Each Tournament our hope is to run multiple skill level brackets for each tournament. Tournament costs in 2015 will be set at $19.95 This is a great price that allows you to play multiple matches against competitive players. Darren Smolkin, a Tennis-Los Angeles player, is currently on an exciting chase to break the record for most matches played in a year. The current record, set in 2012 by Jorge Daniels, is 147. Darren is easily on pace to break that with 91 matches already played this year! What makes it even more impressive is that Darren just started playing tennis 2 years ago (at age 45). 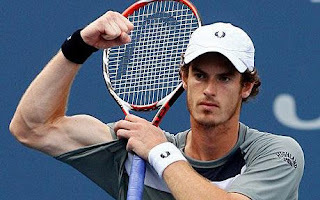 Since then he has honed his skills and sports a winning record in the Advanced Men's division. Tell us about your most memorable match(es): I have a few that stand out above all the others. My first match in the league against David Goldman. I never played competitive sports before and had only been playing tennis for a year-- I was extremely nervous the entire match. I ended up losing, but it was still fun. After being in the league at the 3.0 division for 6 months, they bumped me up to the 3.5. I ended up getting slaughtered. I played Andy McCormac and he beat me 6-1,6-1. He had a very powerful forehand and I was scared to play him again. They put me back down to the 3.0 and I started to take lessons. After 4 months, they moved me back up to the 3.5. I played Andy again, still lost but fared much better. Within the last 6 months, I have been playing him and winning almost every time. he now says he is "scared" to play me! What a compliment. Lastly, the final match in the spring 2015 playoffs against Valentin Ionescu Tiba, which I won, will always be my most memorable match. Who are your favorite rivals in the league? Why? By far my favorite rival is Keiji Tomita. He is the ultimate defender. He gets everything back. He has won most of the times we have played, but they have always been close. I get a great workout playing him and always feel like I just came back from war after our matches. Do you have any other interesting comments about your experiences with the league? This league is great because anytime you want to play tennis you can find a person to play with, whereas if you're trying to play with friends their schedule may not match yours. What do you love about tennis? 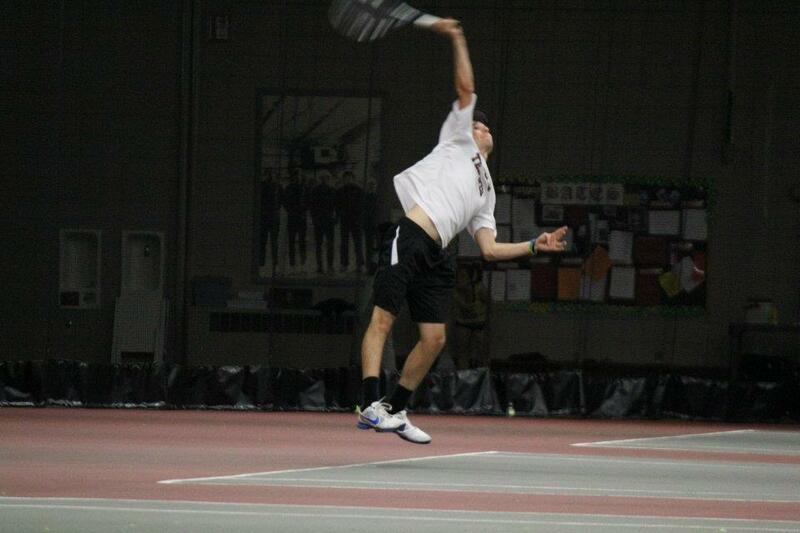 The part of tennis I love the most is the workout. I would much rather lose 7-5,4-6,7-5 than win 6-1,6-1. Nothing beats playing a long, close match, win or lose. 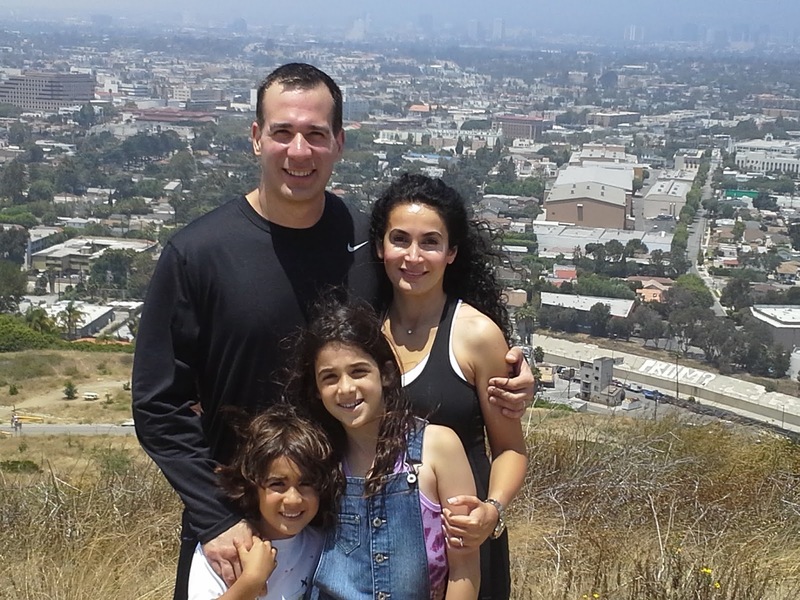 Tell us a little bit about yourself: I grew up in Canada and moved to Los Angeles in 1995. 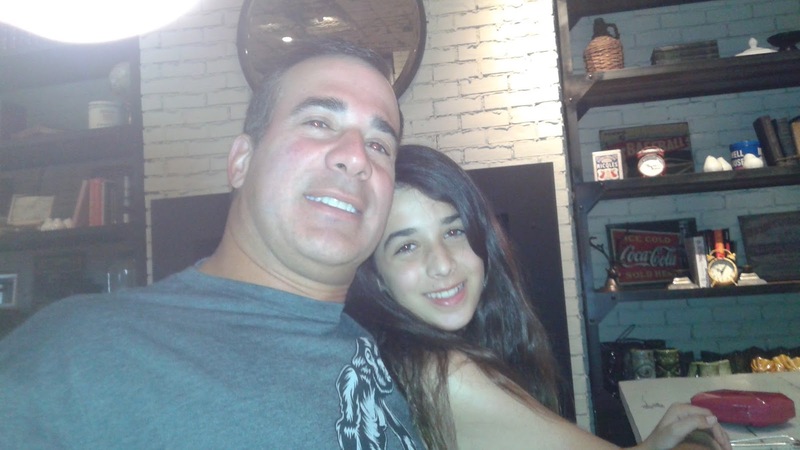 I am a dentist, married with 2 kids. Prior to playing tennis, I did not do any cardiovascular activity. I was heavy into weightlifting for the last 20 yrs. I happened on tennis by accident when I was 45 (2 yrs ago) and have been addicted ever since. The tennis league keeps a running stat page for the most number of matches played by anyone in the league over the whole country ever since the league has been in existence. The top player has played 147 matches. I'm planning to blow this out of the park with a number that will never be touched. My goal is 200 matches, it is now the beginning of June and I have played 91. I might even surpass my goal!